I’m not sure if you caught it, but actor Geoffrey Owens recently appeared on ABC’s “Good Morning America” after an incident that took place in New York. You might remember Owens as the actor known for his comedic role as Elvin Tibideaux on The Cosby Show, between 1985 and 1992. 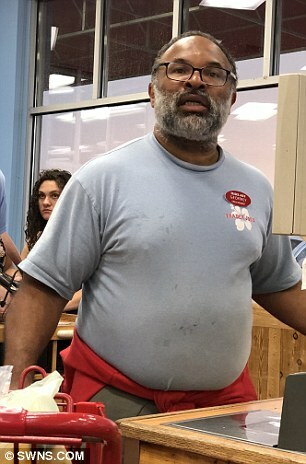 Photos of Geoffrey, working in a Trader Joe’s, were published by The Daily Mail, which many characterized as “job shaming.” Owens acknowledged the posts, but then appeared on “Good Morning America” to talk about work. He admitted that he’s been an actor for over thirty years now, but sometimes that’s not enough to make ends meet. So, he’s been hustling between gigs. He has taught, he’s worked retail and he’s run a theatre company. But when seen as a clerk in Trader Joe’s, customers felt they had to “shame” him for “stooping so low”. This flies in the face of what too many of us have come to believe, unwittingly. Over the last five years, I have watched job openings expand across our country. Many of them are the type of jobs I would have grabbed as a teenager. But teens today are choosy and many of them don’t work at all. Parents even discourage their high school or college student from working—so they can focus on grades. While I understand this logic—it is incomplete and shortsighted. The numbers show that employment today is the best guarantee of employment tomorrow. Jobs are better predictors of success than grades. Now, don’t get me wrong. I believe in students working hard in class—but it is not a facsimile of the working world they will enter upon graduation. Ten years ago, we began to read how Millennials were not working jobs until after they graduated from college. What did many discover? Employers said they weren’t ready for a career. The classroom had failed to prepare them for the workroom. Taking a test does not equal taking on a task that must be monetized. While more Generation Z teens today want to start working earlier, too many are prevented from working by mom or dad or an athletic coach. Those adults don’t want work to get in the way of other priorities. Let me remind you—those other priorities may be less important than working. When we work, and receive payment, something satisfying and clarifying happens inside of us. It can only occur, I believe, when we trade in our time, effort and talent for remuneration. We become sharper because we recognize that excellence actually leads to better remuneration. Reality strikes, and all things artificial or superficial fade. If we’re alert, we examine what we did that led to better outcomes. We begin assessing how to best use our income, because it required sweat equity. What If We Told a Different Story? What if we exchanged “job shaming” for “job claiming?” By this I mean, we teach our kids that claiming jobs while still in school—any job that requires effort and builds a skill—is a good thing. What if we taught them to think of work as desirable? I worked my first job at 12 years old. I became a paperboy, riding my bike at 6:00 am, tossing newspapers onto driveways and collecting payments door to door on Fridays. It was not always fun—but boy did it get me ready for my next step. At 16, I worked at “Charburger,” a fast-food restaurant in San Diego. My first job was to hose down the parking lot at 6:00 am before school started. Soon, I began working in the kitchen, and later became the head cook. While in college, I worked three jobs, cooking at Southwood Country Club, serving customers at Taco Bueno and leading a youth group at a church. Soon, I began teaching both high school and college students. These were the realities that not only prepared me for my career, but they also opened doors for me upon graduation. I had five job offers when I graduated, while some of my fellow seniors who made better grades—had none. John Maxwell hired me upon graduation and never once asked what my grades were. He did, however, ask about my work experience. Geoffrey Owens’ story about his “work ethic” led producer Tyler Perry to offer Owens a role in The Haves and the Have Nots. In addition, rapper Nicki Minaj offered Owens a $25,000 donation as a way to help the actor financially. After other offers came in, Owens decided to take an ongoing role as Commander Adams on NCIS: New Orleans. He’s doing quite well. I’m just saying…I’m not saying. That’s the attitude we should both be modeling and instilling in our students.